Now that we’re almost through the overeating season, most of us will be thinking about dieting and exercise. A look at Facebook the day after Christmas confirmed this for me – a lot of moaning about how much people ate, the need to go back to the gym (tomorrow for sure!) and above all, the obvious tone of guilt. 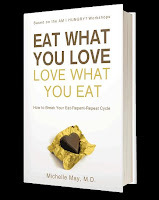 This won’t do, according to Dr. Michelle May in her book Eat What You Love, Love What You Eat. She’d like you to stop looking at your holiday (over)eating as good or bad. It’s just food. Foo d shouldn’t be a reward or a punishment, Dr. May claims, and this means that the Eat to Live/Live to Eat debate is beside the point. Everybody eats to live, and everyone has foods he or she likes better than others. They key to combining the two is to understand yourself and your eating habits and learn to improve them. You’ve probably seen most of the information in Dr. May’s book before. Magazines like Shape, Self, (Insert-your-gender-here) Health and/or Fitness, Cosmo, and countless others thrive on providing snippets of this sort of advice (with considerably more drama, though, and a lot more exclamation points). Eat What You Love puts it all in one place. Dr. May doesn’t make self-examination fun, but she helps you step through it in a way that doesn’t make you feel like you’re watching Dr. Phil. And also without “inspirational” photos of people who are obviously far better genetically-endowed than you are. The first and most important thing, according to Dr. May, is to learn when you’re really hungry, as opposed to when you feel like eating. Seeing or smelling appealing food can trigger hunger, but more often it’s just a desire for that particular food making you think you’re hungry. Once you can objectively evaluate your hunger, you can eat to satisfy it. Don’t wait until you’re too hungry, because you’ll grab whatever’s on hand. But don’t eat when you’re not hungry enough just because you think you might not have a chance to eat later, either. Whether it’s a walk around the office, a glass of water, or a quick e-mail to a friend, there are ways to distract yourself from eating when you’re not really hungry. And there are ways to avoid getting caught without something to eat when you are genuinely hungry, too. By understanding hunger and its triggers for you, you’ll also be able to navigate situations when you’re going to be exposed to a lot of food, like restaurant meals, parties, and holidays. And yes, you will overeat sometimes, unless you’re an ascetic who finds nirvana in self-deprivation. If you’re attuned to your body’s hunger, though, you will compensate gradually for these occasions, because you’ll feel like eating less. So don’t make them into more than they are – we all have enough things that are more important to worry about. Obviously, I’m oversimplifying. Understanding why you eat when you’re not hungry isn’t always easy, and Dr. May says up front that addressing the underlying causes is not necessarily something you’ll get from a book. That said, there’s a lot more substance to help here, including important nutrition information, ideas about portion control, advice about not being unrealistic about exercise, and some things to look out for in terms of medical conditions and their relation to food. Lest you think I’ve gone soft on you, I did have some quibbles after reading it. There’s a fine line between motivation and personal stories to fill pages. The book leans a little too much toward the latter for my taste, and I skipped them after the first few. And while Dr. May clearly tries to avoid psych-speak, some of it sneaks in there anyway (in control vs. in charge...I’m not sure I get it or if I should care one way or the other). The most serious let-down for me, though, is the recipe section. While Dr. May makes no claims that this is a cookbook, she’s married to a professional chef. So I had hoped that the recipes might be more interesting. But even the most casual reader of this blog will have seen the few recipes in the book done better elsewhere. In the end, though, these things didn’t keep me from thinking the book is useful. It’s worth reading, even if you think you’ve heard it all before. 2012 is a new year, after all, and maybe it’s time for a new approach to eating, too. Holiday Cocktails: Keep 'em Coming! 2 Free Tickets to See Melissa Clark! Six Geese a Laying Some Awesome Prizes for You! 25 Cocktails of Christmas? Yes, Please! 12 Days. 12 DC Blogs. 12 Awesome Prizes!